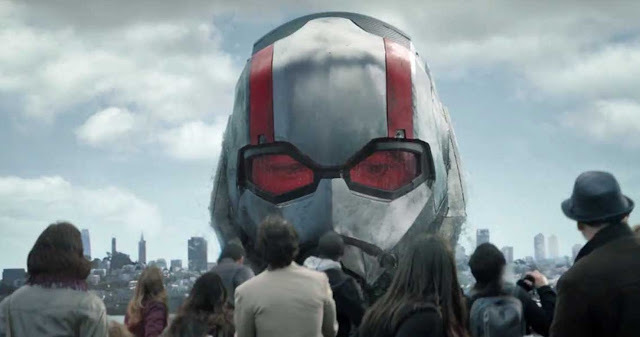 I'll be excited to see what Peyton Reed can do with a movie that he firmly pulled together from the beginning, rather than having to do clean-up work on the ugly situation that surrounded 2015's Ant-Man. All the same, he made a fairly entertaining - if restrained - film three years ago, and this one finally drops Evangeline Lilly into the shrinking, fighting in costume action. This proves extremely promising on its own. Hope running down the edge of that knife and throwing a giant Pez dispenser are definitely the highlights of the video above. Not much focus on the villain really, but what else is new? That glimpse we get of Ghost is pretty "blink and you'll miss it". Ant-Man & The Wasp is in theaters July 6, 2018 and has a wide open field to rule the Summer for a few weeks, hard to imagine Marvel won't have another nice hit on their hands. It's basically just becoming the law at this point.